Contouring can be seriously scary, especially when the results are so drastic that you can’t even recognize yourself. The trend was originally meant for red carpet looks or on-stage makeup to accentuate facial features so they would stand out in low lighting or from afar. But the concept can definitely be translated into your everyday makeup routine in just a few simple steps. 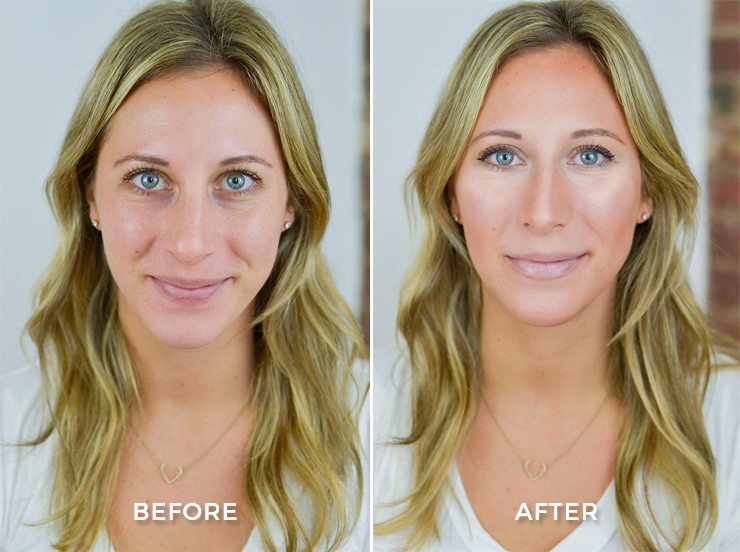 With the goal of enhancing your natural face shape, this subtle contouring tutorial can be done with products you already own in just a couple minutes. Take a look! Use a concealer or foundation one shade lighter than your natural skin tone. Apply (you can just use your finger) under your eyes, your chin, the top of your nose — any area you want to highlight, or bring forward. Use a soft brush to blend into your skin. While you can use a foundation one shade darker than your skin tone, I just like to use my bronzer. But instead of applying it with a fluffy brush like you normally would, use a more dense brush that will apply the product more heavily. This bareMinerals brush does the trick. Swipe the bronzer down the hollows of your cheeks, on either side of your nose, and along your hair & neck line. Focus on areas you want to fade into the background. Blend with a big fluffy brush. I like to use a translucent finishing powder to blend everything together so the look has a natural finish. Use a big fluffy brush and swirl all over. Finish with your usual makeup routine and you’re done! So, what do you think? Would you add this to your daily routine? You look beautiful! I had been contouring then stopped out of fear that the bronzer was making me look dirty…might have to give this another shot! Love this tutorial! You look gorgeous! This is amazing, so natural!